Nope, Im not going to start by yakking off these cheesy lines. Oh or did I just. I been so lazy and busy (excuse excuse!) that I been meaning to post up pictures of the hardcover Coffeetable albums I do offer and, as title, the vouchers I do offer. So people know, you see. Well, they work like this. If you have friends who are engaged, or parents celebrating their silver/gold anniversaries, or you simply wanna pamper someone with a good vintage shoot (ahem!).. 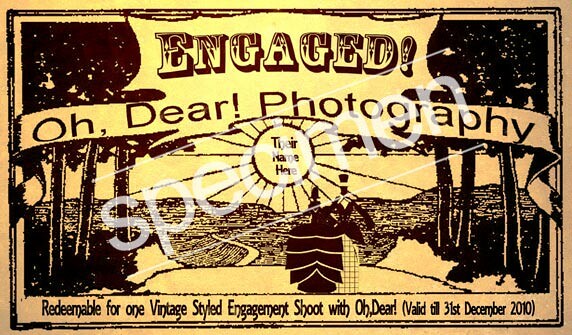 you can purchase Vouchers (see below for a sample) from Oh,Dear! They are redeemable for 1 photoshoot.. This entry was posted on September 21, 2010 by ohdearphotography. It was filed under Bridal Shoot, Engagements, Inspirations, Personal .